It solves Face ID and i-Cloud Bugs. If you have an iPhone X or Xs, you should definitely upgrade. This is mandatory if you want to protect Knomee with personal identification (touch or face recognition). The quest library has been expanded with a few new quests. For instance we have added a quest for pregnant women (how to reduce cramps) and a keto diet quest. Knomee is quite useful to help you monitor your diet and we expect to see more such quests in the future. One team member is using Knomee to track the benefits of the paleo diet with surprisingly good and significant results. The font size on the home screen is now dynamic and adapts to your iPhone model and the type of labels used by your quest. The "quest swipe" capability (the ability to move from one quest to the other by swiping right or left on the home screen) has been significantly improved. This also applies to the "swipe up/down" capability to move from "home" to "chart" view and back. Knomee has been available for over a year, it has been a great learning journey from our team. We have managed to recruit organically a fair amount of users, thus gathering very interesting feedbacks. This comes from the analytics (number of user, various steps that were explored) and explicit comments through email and social networks (such as Facebook and Twitter). The short story is that Knomee is too complex for most users who quit after a few days of exploring the different menus. Fortunately, some of you go further with their Knomee experience, which gives deeper insights. Our main hard problem is that the value proposition is not perceived by most users. 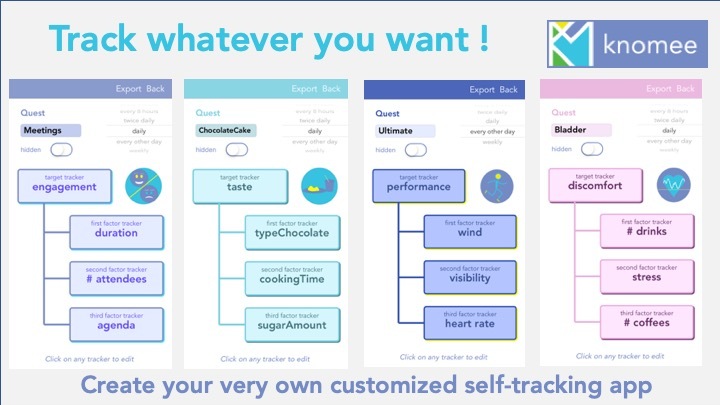 For people who start a self-tracking journey, Knomee ends up delivering lots of value because the quests are personalised and because the insights that are permitted by the quest structure are actually useful. Some users have been able to improve significantly their lives thanks to the behaviour change supported by Knomee. Simply stated, it takes a few weeks of self-tracking before Knomee starts to shine and this is too long for most users. A key request from you, the Knomee users, is to be able to personalise your tracking with notes, short time-stamped memos that record the context of a measure. This is a very legitimate request, since a self-tracking app is very much like a diary. Also it is a common feature of most mood trackers. Another key interesting message that we hear from our users is "if I confide my personal data to Knomee I expect a nice display of my data, both pleasant to look at and insightful". 2019 will be a journey towards getting our data visualisation on par with the best professional tools. The next release will add all the fixes that we have pushed forward during 2018 because they require a database model change. The good news is that we are going to solve irritating problems or add features that our users have been requesting frequently. The bad news is that it will require you to start fresh and reimport your data (quests or measures) ... or start with a new set of quests. Memos: at last, you will be able to add notes and see them on the chart view, which will become your personal diary. Upgrading our database schema will allow to make a number of choices persistent. Quests will evolve towards an open library model (cf. next section) - where quests authors (a new role, this could be you) will enrich the quest with additional info such as a "pitch description" (why would anyone use the quest) or a feedback email (if you want to share your data). The notion of a "quest author" should match the needs of coaches (from sports to diet) who want to leverage Knomee to promote behaviour practices. As told in the previous section, the "chart view" will improve constantly with better displays of the graphs (data tracking curves) and insights. The current release date for Knomee 2.0 is April 2019. Because our main challenge is a communication problem, our main strategy for 2019 is to listen. The app will continue to evolve to fix bugs as required by our users (after a year of feedbacks, it is obvious that a self-tracking app needs to be flawless), but we have no other plan for new features than those proposed with Knomee 2.0. On the other hand, you can expect from us a redoubled effort on our communication front, either on this Web site or our social media accounts. The set of quests that is offered in the Knomee library. Very soon, this library will be open-sourced : if you upload a quest to our GitHub, it will be part of the next release ! A key principle from the quantified self movement is that you should use tools that let you do whatever you want with your data, that is, that do not keep the data locked in some proprietary format. measure data, that you generate each time you record a value from one of your quest. quest meta-data, that describes how the measure data should be interpreted. Measure data can be exported and imported through CSV files, as shown on the illustration. 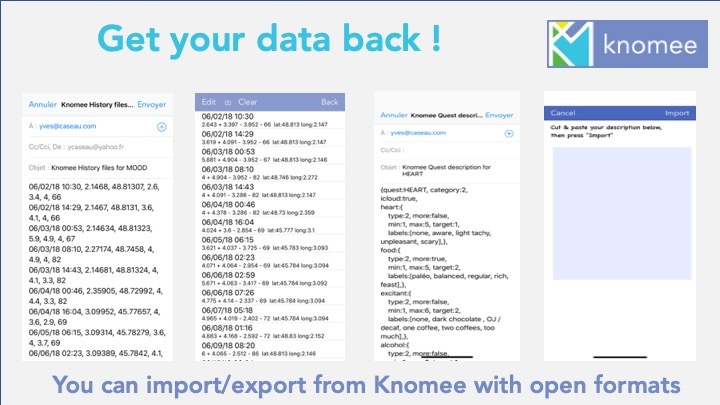 to export your data, you press the export button on the "chart view" (small rectangle with a outward arrow), and Knomee produces an email addressed to you with a CSV (comma separated values) file of all the measures from this quest. You can upload them in Excel or any tool of your choice. The format is: date, longitude, latitude, measure target value, measuer first factor value, second factor value, third factor value. to import your data, you open the measure list interface (second screenshot on the illustration) and you click the import button (small rectangle with an inward arrow). This will open a text zone where you can paste any CSV file that you have copied from your phone. Using these two steps is a way to perform back-up & restore. Meta-data can be exported and imported as JSON files. The JSON format is a self-evident description of your quests, its attributes and its trackers. to export a quest, you open the edit interface and click on the export button. This will generate an email to yourself, with the JSON description of your quest. Remember our promise to use only email as a tool to move data out from the application so that you may control this flow better. to import a quest, you open the quest list interface (as if you were to select a quest), and you will seen the import button (same, a small rectangle with an inward arrow). This will open a text zone where you can paste the quest description. What you need to remember is that your data belongs to you (we cannot see it at Knomee) and that it is not stuck in your app, you can get it back whenever you want. Knomee 2.0 will make sharing quest descriptions easier since we will create an open GitHub with all the Quest Library descriptions. Anyone will be able to add to this list of quests. Design your own self-tracker for 2019 ! Happy new year from the Knomee application team ! January first is traditionally the time for "New Year resolutions" ... that do not survive a few weeks most of the time. Self-tracking can help : science has shown repeatedly that tracking your goals and your habits develop both self-awareness and motivation. Knomee is not just a tracking app, it is a generator for customised tracker. Using Knomee you can create in less than 10 minutes your very own tracker. The first one is a "business life / performance" case where you want to see how to improve the engagement in your meetings. You assess the performance (i.e. engagement here) of each meeting that you attend, and you also track three factors : the number of attendees, the duration of the meeting and the presence of a meeting agenda. The second example is self-tracking applied to improving your family chocolate cake recipe. You track how good your cake tested based on which kind of chocolate you used, how much sugar you used and how long the cake stayed in the oven. Obviously, as soon as you have found the best parameters with those three factors, you will move to other such as the amount of butter or the oven temperature. You can use Knomee to monitor your performance with any kind of activity, since you are free to use your own scales with your own words (labels). Here we show a "Ultimate game tracker" where you also track your heart rate and weather factors such as wind and visibility. The last example shows how personal self-tracking can be. Here the Knomee user is suffering from bladder discomfort when urinating, and trying to see if the number of drinks (especially coffees) and the current stress level have an impact and could be used to reduce the discomfort. These four examples have nothing to do with New Year resolutions ... because each of these resolution (quit smoking, loose weight, play more with your kids, read a book each month, ...) is personal and we thought that showing you examples of resolutions might downplay your motivation. It is time to act, and it is your job : define your new lifestyle tracker and use Knomee to get some insights about yourself. When you start Knomee, it comes with three pre-defined quests, to help you get familiar with the app (mood, energy and sleep). Most often, we hear as first feedback : "Knomee is not for me, I do not care about these things. 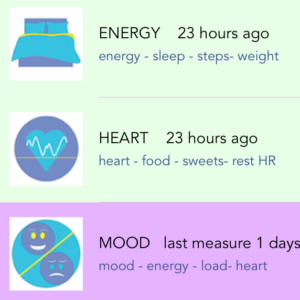 I don't want to track my mood and my sleep/energy patterns are fine". This is not what Knomee is about ! Knomee is about tracking what matters to you. Thus you should quickly forget about the pre-defined quests and build your own. it is a tool to help you define your personalised tracker. Knomee assign a score (from zero to 100%) to each quest, that is displayed on the main screen in the upper right corner. If you click on this number, you access the quest score view which is illustrated with the image above. Here you see a quest with a score 68%. 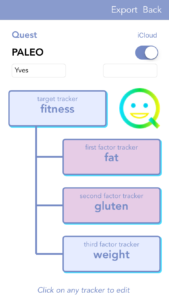 To follow-up on the previous post, this is a quest whose target is “fitness” (that is measured using labels who are unique to the user of this quest), while the three factors are respectively the amount of ingested fat, ingested cereals and the rest heart rate as measured by the Apple Watch. The insight score : this tells you if Knomee has found interesting insights using the three factors, or the time, day and location of the measure. If this sub-score is high, you will see that the relevant factors are coloured. In this case, “fat” and “cereal” are positively correlated, so they are coloured as green. The “chart view” is where you will get more details, but if you click on one of the factors, you will get a short insight summary as a forecast. In this example, the strength of the insights is not very strong so the sub-score is 25%. The forecast score : this says if Knomee is able to forecast your successive measures well. Recall that whenever you enter a new measure, Knomee pre-position the sliders to its “guessed” value. This is mostly offered as a way to make the app faster and more playful, but Knomee keep the score on its forecasting capability. In this example, Knomee is on average 10% away from the actual value, which translates into a good third subscore of 77%. A good forecasting score is a sign of Granger-causality. At first you will simply look at the score on the main user screen (the measure capture screen is the home screen), but after a while you will probably venture to this quest score screen to understand your quest score better. You can see that the rest of the screen displays a description of your quests, with colors to attract your attention on the relevant factors. What does my score tell me? A score below 50% says that either your quest is too young … or that it is not very significant. There may be many explanations, but most often it means that your causal diagram hypothesis is false. Put more bluntly, it means that your factors do not seem to have much influence on your target. As said repeatedly, this is a critical feature: Knomee helps you distinguish between your “hunches” and “data-supported causation schemes”. As it turns out, we are often “fooled by randomness”. A score over 70% says the opposite: your “causal hypothesis”, i.e., your quest, is definitely interesting. By navigating through the various screens, you are likely to find interesting insights. If you have allowed Knomee to send you notifications, you will receive one of these insights daily. A score in between means that your quest is interesting but there are probably many other factors influencing your “target”. At first, play with the default quests to get familiar with the app. Although we tried to select three quests with a broad range of interest, you are likely to get bored quickly or to say “this is not for me”. Remember that there is a “quest library” so you can substitute many other quests to start this first learning stage. Knomee starts to be interesting when you define your own quest. We have tried to make this as simple as possible, and we shall continue to work on our design. 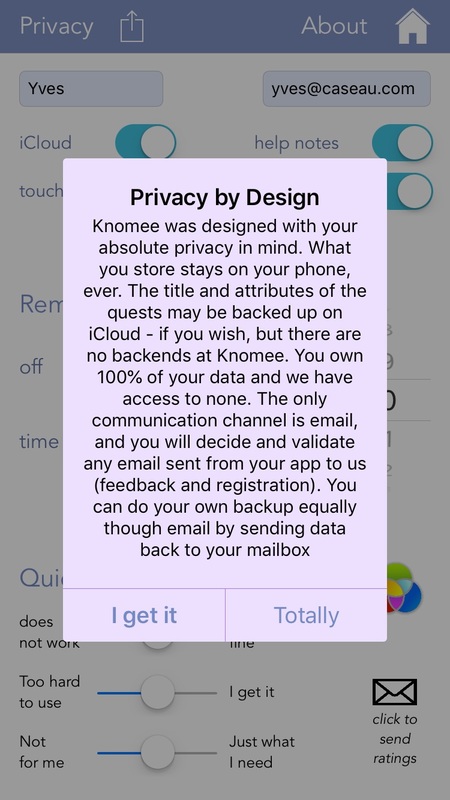 Knomee is not “another self-tracking app”, it is “your own tracking app”. It takes five minutes to define a new quest, and then you can enjoy a tool that is unique to you. However, our experience suggests that you need to play with the existing quests (stage 1) before moving to stage 2. There is only a finite amount of self-knowledge that your will extract from a given quest. After a delay that varies from a few weeks to a few months, you will be done with that quest. There are two ways to keep using Knomee : try a new quest, randomly, once in while … or continuously optimize your quest by changing the factors, the scales, or the data sources (switching from declarative values – when you input your data- to automatic values – when the value is read from a connected device through HealthKit). Once you reach this third quest, you should consider sharing your quest with others. The screen shown above has an “envelope” button that allows you to share a recommendation through email. In the future we plan to make quest sharing simpler and more seamless. What is a Quest and why does Knomee use quests ? Quests are central to the Knomee experience. On the negative side, they make Knomee a self-tracking app with a steeper learning curve, that requires a little bit more time and effort, compared, for example, with one of the activity or mood tracker that one may find on the App Store. On the positive side, quests give more sense to tracking, they make the tracking experience more fulfilling and they help Knomee give you more meaningful feedback about yourself. A quest is a group of things that you want to track, each of them is called a tracker. 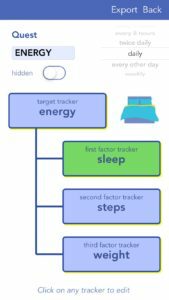 Trackers are defined by one thing (weight, sleep, activity, mood, etc.) that you track, either by entering the value (using the sliders in Knomee’s interface) or by importing the value from “HealthKit”, the Apple service on your iPhone that collects all data from your connected devices (wristband, watch, scale, sleep monitor, etc.) or your iPhone itself. A quest is what is called a “causal diagram” (albeit a simple one) in the scientific world. This means that a quest represents a causal hypothesis that you make, about yourself. A quest has one target and one to three factors. 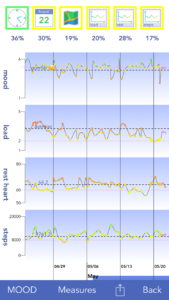 When defining a quest, you tell Knomee that up to three factors (say, the time you go to bed, the amount of steps that you walked, and the richness of the dinner that you had) have a causal influence on something that you care about, the target tracker (in this example, it could be the number of hours that you slept). Self-tracking is good for you but boring. This is not an opinion, this is a scientific fact. It is proven that self-tracking helps you both to know yourself better and to help you change your behaviour towards a goal. It is also proven than most people stop self-tracking quickly, from a few days to a few weeks. Knomee was created to tackle this challenge, and it is a hard one. The only thing that makes this self-tracking worthwhile is learning about yourself. This is why we selected “self-tracking with sense” as our motto. We came up with the quest idea for two reasons. First, a “quest” is “indeed a quest to know yourself better” and to see if your “causal hypothesis” happens to work. In many cases, using Knomee is a way to see if doing some particular effort is “worth it”. Second, a causal diagram is a powerful tool to orient the machine learning and statistical analysis. It makes the problem of “making sense from your data” easier and helps us keep everything on your phone (hence our guarantee of full privacy). Quests don’t last: you formulate a hypothesis, you learn (or you don’t) from it and you move to other things. We have made it easy to add and drop quests to Knomee. Our usage statistics show that this is not properly understood yet. Many users start with the pre-defined quests and never venture to create their own. This is a shame since it is unlikely that those pre-defined causal diagrams apply to you. 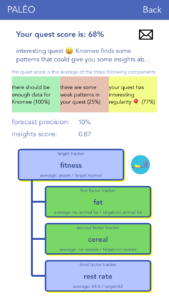 Quests are meant to be shared: the future of Knomee is to make it easier to share successful quests with others (sharing the model, the causal diagram, not your data). In a reciprocate way, it would be nice to be able to look at quests that have been successful for people who have the same “target” goals. For instance, although everyone is different, it would be nice to have access to a collection of successful quests from people who tried to improve the quality of their sleep. Currently, sharing is possible but cumbersome: you send the model/quest description to a friend through email … and she/he may import it. The quest library is another way to benefit from quest sharing but this feature is still in an infancy stage. You may wonder why no other tracking app is using quests. This is because we take our mission “self-tracking with sense” seriously. It is clear that it is hard to make sense with one single tracking dimension. You know this already if you are using a tracking app or if you are looking at your health app on your iPhone. At first seeing all this data and this nicely shaped charts is exciting, but you get rapidly bored because there is not much value there. The chronology (looking for weekly, daily and hourly patterns) is the most interesting part, but only a few apps do a decent job at it. If you “self-track” regularly, you will notice that the interesting questions arise from the combination of factors. There are a few Knomee competitors that upload all data in the cloud to search for any interesting combination or pattern. We already said that using quests (simple causal diagrams) makes the analysis simpler and suitable for a “device-only” solution (everything on your phone) but there is another reason for using quests. You are in charge, you know better than anyone what questions are interesting for you. Knomee “sense-making” algorithms just improved ! A new version of Knomee, 1.9, has been made available on the Apple AppStore just before Thanksgiving. 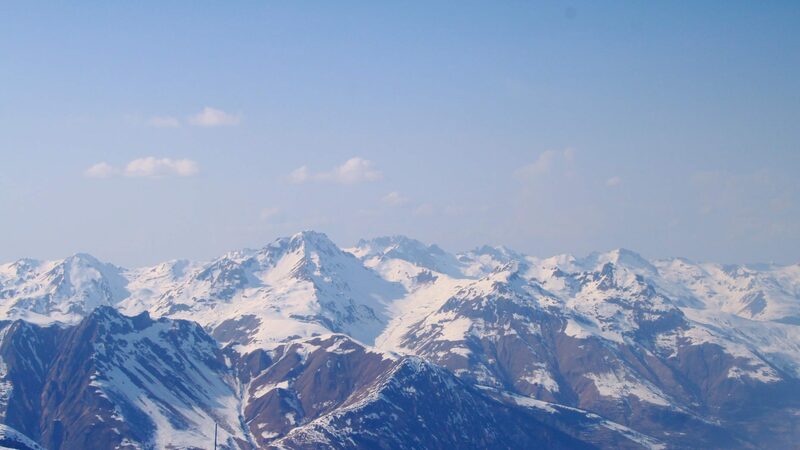 It has been almost six months since the previous (1.8) release, we took the complete summer to re-calibrate the insights and forecasting algorithms. After a year in existence, we have accumulated enough experience to improve the robustness and the relevance of Knomee algorithms. Insights, scores and data visualization explanation will be more relevant and robust in the future. We have added quests categories : sleep, mood, food, health and activity. It makes navigating and selecting new quests easier. You will recognize the quest category with a small icon that is displayed next to the quest name in your quest list or library. Sleep tracking is on the rise since the amount of evidence that sleep is our #1 tool to improve our well being keeps piling up. There are many apps and devices to help you track your sleep (we like AutoSleep) but there is only Knomee to help you understand why you are getting good or bad sleep numbers. The user interface for quest score has been simplified, and we dropped the “ken score” name that was confusing to most of you. The quest score tells you how “interesting” and “robust” your quest is. A score below 50% says that either you do not have enough data, or that your quest is not insightful, that is, the factors that you are tracking do not seem to play a significant quest towards your goal. Remember that Knomee’s number-one value is to help you find out if there is a relationship between differents aspects of your life that you are tracking. Most often, there is none ! We are “fooled by randomness” to quote Nassim Taleb. A low quest score tells you that you may be looking for sense where there is none. Navigation between the different user interfaces leverages iOS transitions better. The user manual with its tip section has been improved, it should be easier to learn about Knomee while using it. The use of coloring for feedback has both been extended (when you enter a new measure) and improved. The first part is that Knomee signals you whenever you enter a new measure whether you are close or far from the target values that you have set. Knomee uses the same color scheme to indicate “good” to “worse” values, and remember that you can change it in the options. If you are new to Knomee, the “blue” color setup is the simplest to use because of its vivid colors : red is bad and green is good. 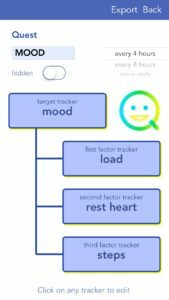 The second part is what make Knomee different from other tracker apps: as soon as you have enough data, Knomee uses red/green colors to tell you which factor “help” or “play against” your target. You get this coloring in the “Chart user interface” (click on the “eye button”) and with the quest score interface. Insight generation has been improved both in wording and relevance. When you have enough data, and if you have enabled notifications, Knomee will send you insights daily in the form of short notification messages. All this information is available at any time in the “chart” user interface. Knomee uses a family of algorithms for analyzing and forecasting self-tracking time series. Stay posted on our web site since we plan to share more about this in 2019. When you use Knomee most of this is implicit : Forecasting is used to animate the sliders and make your self-tracking more efficient, trend analysis is embedded into the mountain icons (the mountain shape tells you about the distance to the target and the weather tells you about the trend), tracker scores are transformed into colors and insights. When used right, Knomee has the potential to change your life and help you to improve your health significantly - it has happened to this author. This has nothing to do with the technology that is embedded in the Knomee mobile application but everything to do with the fact that behavior change can indeed improve your health and your wellbeing. One of key challenges that the Knomee team faces is to keep simplifying the Knomee user experience so that everyone can enjoy the benefits of a mobile-computer-aided self-tracking. This is why we constantly ask for feedbacks from you, our early-users community. We will continue to release a new version of Knomee every month and we pledge to improve the application continuously. Knomee really shines when you have defined your own quests but many users complained that creating a new quest was a tedious and error-prone exercise. This is why we have introduced a new “QuestView” in Knomee 1.6. The view makes the quest structure, which is made of "one focus tracker" and 1-to-3 related factor trackers more explicit. When you create a new quest ! this was the most complicated screen in Knomee, the experience is much nicer. We have separated the quest and the tracker editors. We have also fixed a number of bugs that made creating a new tracker difficult. When you click on your KenScore. You can now see a summary of your quest with colors that tell you which trackers have a positive (green) or negative (red) impact. On the previous image, you can see that fat and gluten have a negative impact on the main "fitness" tracker. When you add a quest from the quest library, it makes it easier to pick a quest and customize it to your needs. When you press the edit button from the home screen. You simply click on any tracker (rectangle) to access the tracker editor. What is coming next ? Knomee 1.8 will propose a massive improvement of all the text that Knomee such as insights. They really look like computer generated statement ... we have found ways to improve on that. We are also going to go deeper with the insights. The list "automated trackers" that you can import from HealthKit will grow, because we want you to better leverage self-tracking from your Apple watch or from great apps such as AutoSleep.